The history of the Thornbury Bowls Club starts with Oliver Gilpin’s purchase of an acre of the Thornbury estate in Normanby Avenue in 1905. Gilpin was a leading merchant of his day, owning a chain of drapery stores. By 1928 his chain had 75 stores all of which were staffed entirely by women, including managerial positions. Gilpin built his own residence on the land, a fine villa named Nyora, which is now the Chris Wynn Reception Centre. He subsequently built a bowling green adjacent to his home. In addition he had a warehouse, factory, fernery and tennis court all built on the land before he left Thornbury in 1910. With Northcote already having a bowling club, opened in 1906, Gilpin invited local citizens to form a bowling club in Thornbury, offering use of his green. On 16th November 1907 the green was opened in an official ceremony, photographs of the day show it to have been a well-attended event. Oliver Gilpin became the first president of Thornbury Bowls Club. He stayed in that office until 1910 when he sold his entire property, including the Bowling Green. Three trustees of the Thornbury Bowls Club bought the green for £775, which put the Thornbury club in the enviable position of owning its land. Cr. W. Hayes succeeded Gilpin as president. In 1927, 20 years after it’s opening, the Thornbury Bowls Club admitted women as associate members. William Olver became a trustee of the club in 1922 and subsequently was president and then honoured with life membership. Olver was twice mayor of Northcote, in 1931-32 and in 1940-41. He was also a delegate and councillor of the R.V.B.A. The club’s pavilion was opened in 1959 with its most recent extensions and renovations carried out in 1980. Club member Bill Broderick led this project, with Jean Chick and Jean Canny leading the renovations of the Ladies section of the pavilion. In 2010, a synthetic surface was installed on the upper green and in 2015 the lower green was refurbished with Tifdwarf grass. Jean Chick is largely responsible for establishing Thornbury Bowls Club on the Bowls map, particularly in the Ladies sections. Jean joined the club in October 1971 and won her first club championship in the 1973-74 season. Jean was runner-up in the Champion of Champions competition in the 1979-80 season, she won the prestigious title in 1994. The club enjoyed a long string of successful ladies teams following on from Jean’s individual success. Jean is regarded as a legend of bowls, having represented Victoria and Australia over a long period. She has been honoured by the Queen and the Prime Minister and at last count had won the club championship 30 times. Her husband, Eric, was a greenkeeper at the club and both enjoy life membership as well as being honoured with one of the club’s greens named after them. The club enjoyed an abundance of members 20 years ago, when it was quite difficult to even get a game of social bowls. 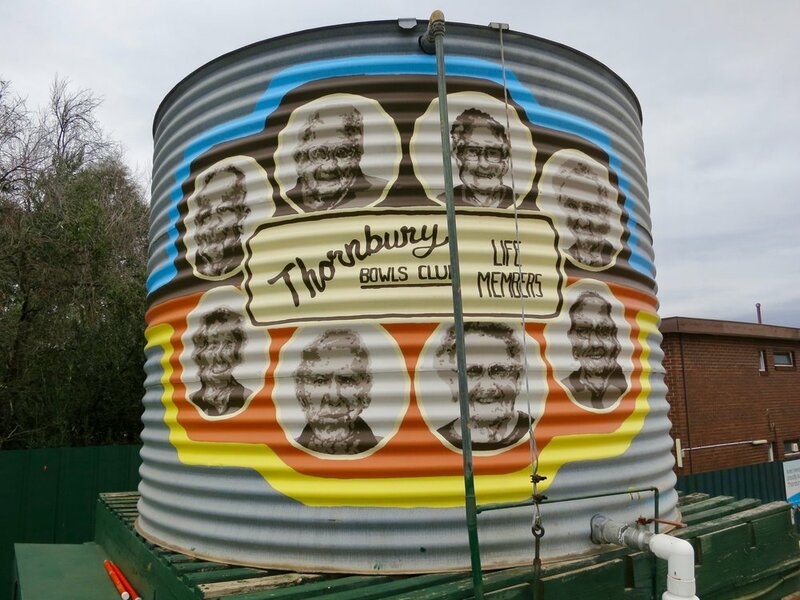 However the changing social demographics of Thornbury have seen a steady decline in membership levels, but the club is trying to recruit new members all the time and attract younger people and new Australians to the game. John Scarratt, Jean Chick, Alwyn McCarthy, Marj Walshe, Mary Wilson, Betty Hales, and Ron Wanstall with artist Brenna Quinlan. Information care of Wendy Dalton, secretary RVBA Mens Section, Thornbury Bowls Club. Perry, Muriel (1995). Just a pocket for the money: the story of Oliver Gilpin and his stores. Molesworth (Vic. ): Author. Victorian Ladies Bowling Association (2003). The Victorian Ladies’ Bowling Association: a history from 1907 to the present. Hawthorn (Vic. ): Author.